6 Performances, 6 Theatres, 6 Actors! In March 2012 Imploding Fictions and OIT presented a unique performance event taking place in six theatres across Oslo. Each night the play is performed by a different actor who has never read the play and who has been told nothing about it. Each performance is therefore totally unique! 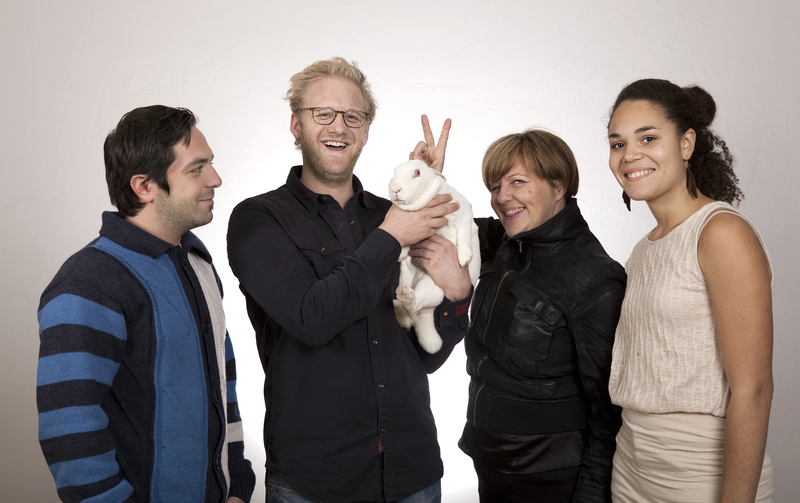 We collaborated with six wonderful performers who brought White Rabbit Red Rabbit to life. All shows were performed in English. For questions and inquiries email Philip or Oystein at oslointernasjonaleteater (a) gmail.com. Ensemble, White Rabbit Red Rabbit. In collaboration with Cafeteatret & Nordic Black Theatre, Black Box Teater, Det Norske Teatret, Torshovteatret & Nationaltheatret and Det Andre Teatret, as well as Volcano, Necessary Angel and Wolfgang Hoffmann. Supported by Norsk Kulturråd, Fritt Ord and Bydel Sagene.